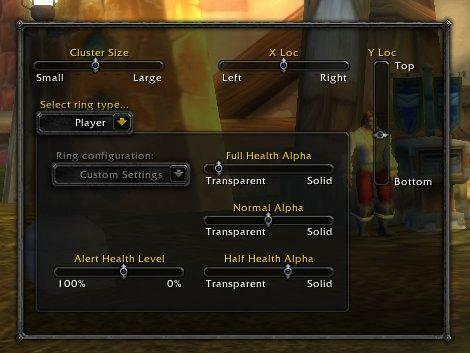 is there any chance iriel or someone else would fix this mod for wotlk? i miss it sooo much. no other unit frame comes close. Last edited by lodewijk : 10-10-08 at 04:46 AM. I used to use this mod way back a while ago, and I absolutely love it. Just thought I'd ask if you plan to update it? I think all of your work is great, but this was one of my absolute favorites. I look forward to seeing it around and active again some time. Ive been looking for a place to move my party because i dont like the default place. the location for party members i find absolutely perfect. 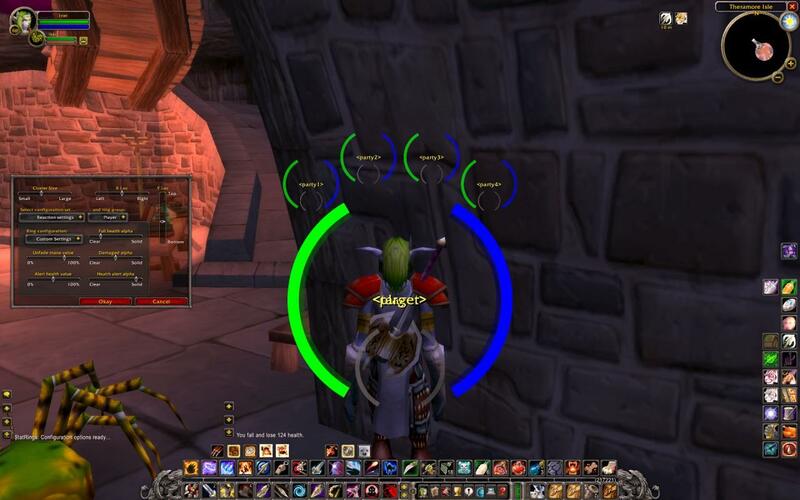 although i am not into the same Circular shape for life/mana of my own character because i have SCT (scrolling combat text) which uses font on that area. but there is nothing better than what you have for the party i think. There will be a 1.10 update soon enough, but not tonight. v_v I'm looking forward to it. Thanks for the feedback Scae.. The name overlap is a temporary issue since I dont have ring label hiding enabled (Normally player name isn't shown, though that should be optional really). Adding in/out of combat rules to the rings shouldn't be THAT hard, I'll add it to my list but I cant promise when it'll be done. As for ring display when moving, i'm going to be transferring ALL of the movement options to the /srdrag format (With a GUI, of course), and that shows everything when it's enabled. Edit: So far the error occurs when logging in, and joining parties. Love the update ^^. Works great. Wish I could set the alpha for outofcombat/incombat tho. I prefer not to see anything until I'm in combat. Edit:The Target name overlaps the player name. Perhaps have the target name naturally offset? Also it would be nice always show the rings when the statrings menu is open. currently they only appear when you mouse of the alpha settings. This makes it difficult when moving the rings as you cannot see them. Last edited by Scae : 01-21-06 at 02:14 PM. This is an outstanding mod. I've experienced no slowdowns at all and it really will help with a particular issue that people often have - The healer dying because they forget to watch their own health bar. Heh, heh... Anyhow, I can't wait to see how you develop it further. This is similar to smUnitFrames ( http://www.curse-gaming.com/mod.php?addid=2945 ) although this, so far, causes a lot less interface lag during heavy action. I wonder how slow my game will be when I start using this addon. Perl classic unitframe is the best ever coded I have used. I'm a little bit afraid to use this addon to be honest. It shouldn't be too bad, while there's a bit of math involved in changing ring sizes, most of the time they're not changing (even in combat, most people's framerate is much higher than the number of times health/mana changes per second), and the code's smart enough to skip work it doesn't need to do. Having said that, at this point in development I've been writing code that's efficient by design, but haven't gone back to do explicit optimization of places that appear to be causing problems (Partly because I'm not aware of any). Obviously if you run into problems let me know and I can see what I can do. I can see a lot of the people likeing the Addon! Keep on working on it. When it gets big i think you well need a website! B/c than it makes it easy for people to get updates! Or at lest have a forum! Than people can post bugs, and what thay think! 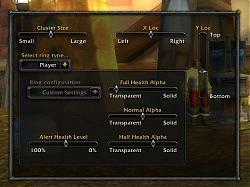 This is like my favorite addon like ever! So like you make a lot of skins/styles for this addons and eveyone picks what thay think is best.